The Booking Robot extension for Joomla allows the public to book services and then pay a fee via PayPal to confirm their booking. Ideal for businesses offering time based services. A booking extension for the content management system Joomla (version 3.X). Responsive in design offering both public and admin support for mobile screen widths. Take safe online payments with the payment gateway PayPal to confirm each booking. An introduction to the key features that you will find on the administrator dashboard. Access to your bookings to find details of what services have been booked and by whom. Bookings can be filtered in many ways to help you find the booking you are looking for. Add and edit your services. Choose how much to charge, what group limits you require and what dates & times the services should be available. Optional extras that your customers can choose to add to the main service. A great way to increase the value of sales. Extras can be charged per person or per group. The list of times that can be associated to the services. All services must have a start time, but a service can have as many start times as required. If you require extra information from you customers when they are booking. You can choose the type of form (text box, dropdown list, check box) and they can be set to required or optional. If you wish to take a holiday or allow for staff days off. Block out all services or just the selected service at a particular time over the chosen dates. We have built in a way to easily edit the look of the public booking styles. Choose text colors, font sizes and button colors to match the look of your website. From the admin dashboard we link to our help documentation & video guides to give you easy access to the information you need to setup and manage the extension. To compliment the main extension, we also offer the option of a booking module. The module can be used in a few key ways. . .
As a public timetable to show what services are available. 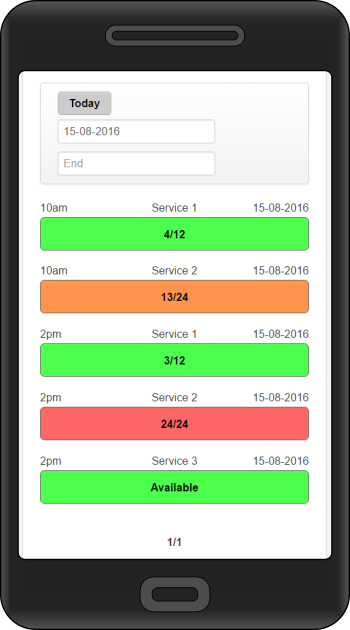 It can allow frontend manager access to make adjustments to bookings while on site delivering the services via a mobile device. As a point of sale interface when taking booking by other means, yet keep the numbers correct to prevent double bookings. It can be setup to allow third party resellers to login and book out the services. The extension has many important features. Responsive in design offering both frontend and admin support for mobile screen widths. Built in support for PayPal. Access Control List support to control who can see or do what. Chargeable extra, sell optional extras to your main service. Forms, request customisable information from your customers. Block dates to prevent bookings, ideal for taking holidays. Control the styling with the built in template controls. Customisable emails both for admin and customer. Services fees can be charged per person or per group. Services that share the same start time can be set as options for the customer to choose between. Minimum and maximum group sizes can be set. Services can be set to publish or un-publish automatically. Services automatically generate availability based of the selected time, day and month. Services availability can be manually added if they don’t follow a regular pattern.